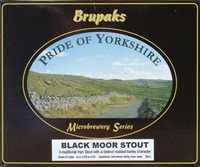 A two can kit from the Brupaks Pride of Yorkshire Microbrewery Series which produces 40 pints of a traditional Irish Stout with a distinct barley character. This beer kit will produce a beer with an average ABV of 4.0-4.3%. The bitterness can be enhanced by using the bag of hop pellets supplied with the kit.